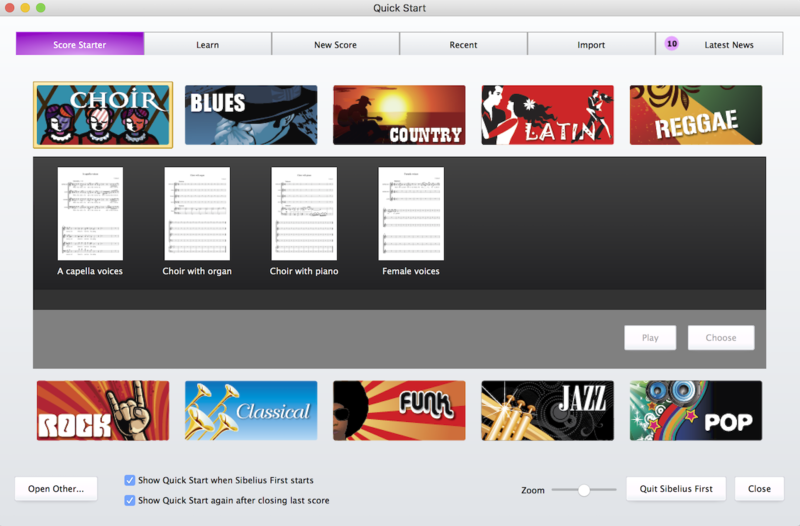 Avid last week released a new version of Sibelius First, its entry-level edition of its Sibelius music composition software geared towards students, beginners, and other users who may not need the more advanced features found in Sibelius. A full comparison of the features in Sibelius and Sibelius First is available at Avid’s web site. One curious item: Exporting audio as an MP3 is supported in Sibelius, but not supported in Sibelius First; only WAV and AIFF audio files can be exported in Sibelius First. If anything, one would think that the users of Sibelius First would be more likely to need the more consumer-friendly MP3 format. Sibelius First is available now. A license allows for use on up to two computers by the same individual. On Windows, Sibelius First will run on 64-bit Windows 7 (SP1 or later), Windows 8.1; on Mac, it will run on 10.9 or higher. In addition, a $179 trade-up offer to the full version of Sibelius is available for educational users who already own Sibelius First, Sibelius Student, G7 or Instrumental Teacher Edition. It’s a full perpetual license of Sibelius and comes with a year of upgrades. Sibelius First can be purchased directly from Avid, or from resellers like Amazon. A 30-day free trial is available. Thanks for this notice, Philip – there is nothing on the tech support forum about it yet, so you have made a scoop! Any chance of an Android app? I would be Interested in the educational trade up offer from Sibelius First for $179, that you mentioned. However, the link you provided leads only to more expensive offers? Thorsten: I was told by Avid that the $179 would be available as described, but it wasn’t yet available in the store. If I receive an update that it becomes available, I’ll post further here. Like what you see? Keep Scoring Notes tuned up with a donation of your choice. You can even set up a monthly donation. 100% of your contribution will go towards supporting Scoring Notes. Thank you! This blog is independently owned and operated by NYC Music Services, a music preparation service in New York. The views expressed in this blog are those of the author alone and do not necessarily represent the policies, positions, strategies or opinions of any company.